Financing or refinancing a mortgage involves three key documents: the deed, the mortgage, and the promissory note. Of the three, it is the promissory note that contains the borrower’s promise to repay the loan and the rights of the lender. Pulgini & Norton represents home buyers and owners in real estate matters. If you need to finance the purchase of a home in the Boston area, or refinance an existing mortgage, our real estate lawyers can advise you on the lender’s terms and their legal impact. Most home purchases are financed. A prospective buyer typically puts a down payment on the property and finances the balance of the purchase price with a mortgage. 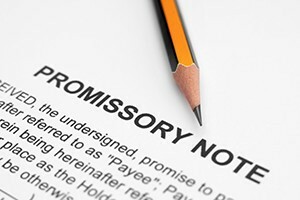 Most home buyers think of the mortgage as their agreement with the lender, but the promissory note is the document that creates the debt. It is the contract in which the borrower agrees to pay back the lender for the amount he or she borrowed to finance the purchase of the property. The deed is the legal instrument that transfers ownership of the property from the seller to the buyer-borrower. The deed describes the property, how the buyer is taking title to it, and the purchase price. The deed is recorded with the local registry of deeds after closing. The mortgage is the instrument that secures the lender’s interest in the property. The buyer-borrower conveys his or her ownership interest in the property to the lender. This gives the lender a lien on the property, or the right to foreclose if the buyer-borrower does not make his or her payment obligations under the terms of the promissory note. A borrower will have to make monthly payments to the lender throughout the term of the loan. Monthly payments include principal and interest, but they can also include other charges, such as taxes and homeowner’s insurance. If the borrower’s down payment is less than 20 percent of the purchase price, the lender may also require that the borrower pay for private mortgage insurance. These additional charges can all increase the borrower’s monthly payment obligation. The monthly payment amount can also fluctuate if the interest rate is adjustable. For instance, a borrower may pay a certain amount each month for a specific period of time, and then the payment amount may change, depending on the interest rate. If there is a substantial increase in the monthly payment, or a change in the borrower’s finances, the borrower may need to refinance or otherwise run the risk of default. An acceleration clause gives the lender the right to collect on the remaining balance of the loan under certain circumstances. For example, a lender may require payment in full of the balance if the borrower drops his or her homeowner’s insurance or fails to pay taxes on the property. A prepayment penalty can also make it difficult for the borrower to refinance. A prepayment penalty is an amount that a borrower will have to pay for prepaying the loan within a specified time period. Prepayment penalties usually add to the costs of refinancing. The property transactions attorneys at Pulgini & Norton offer dedicated representation to prospective buyers and current owners in Boston. If you need to finance or refinance a mortgage, we can review and advise you on the terms of the loan before you agree to sign on with a lender. We can also discuss the legal implications of an existing mortgage and help you find solutions that meet your needs. We represent clients in communities across the state, such as Andover, Quincy, and New Bedford. For a consultation, call our office today at 781-843-2200 or contact us using our online form.